Mrs. Geraldine Kimbrell Hunt, age 96 of Savannah Street, Toccoa passed away Monday, November 19, 2018 at Bell Minor Home, Gainesville, Georgia. A daughter of the late George and Elizabeth Ward Kimbrell, she was born June 20, 1922 in Banks County, Georgia having lived most of her life in Stephens County. She was retired from Wright’s Manufacturing Company. She was a member of Lamar Christian Church and attended Welcome Home Baptist Church. In addition to her parents, she was preceded in death by her husband, Odis W. Hunt and by her siblings, Jack Kimbrell, Blanton Kimbrell, Christine Deal, Quida Hardy, Joyce Kimbrell and James Kimbrell. Survivors include a brother and sister-in-law, Bradley and Mavis Kimbrell, Mount Airy, Georgia; sister, Mary Faye Brookshire of Demorest, Georgia; a number of nieces and nephews. Funeral services will be Friday, November 23, 2018, 2 O’clock p.m. in the Hillcrest Chapel of Acree-Davis Funeral Home with The Reverend Larry Ryals officiating. The following gentlemen will serve as pallbearers, Cody Holloway, Jerry Deal, Randy Kimbrell, Chad Brookshire, Howard Kimbrell and Bradley Hulsey. The family will receive friends at the Acree-Davis Funeral Home on Friday from noon until the service time. Online condolences can be left for the family at www.acree-davisfh.com. 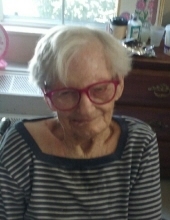 The family would like to express thanks to her nursing staff at Bell Minor Home for the care given to her during her time there. Interment will follow in the Zebulon Baptist Church Cemetery with the Acree-Davis Funeral Home in charge of the arrangements for Mrs. Geraldine Hunt. To send flowers or a remembrance gift to the family of Geraldine Kimbrell Hunt, please visit our Tribute Store. "Email Address" would like to share the life celebration of Geraldine Kimbrell Hunt. Click on the "link" to go to share a favorite memory or leave a condolence message for the family.